The Moonlight Pokémon Umbreon-GX is leaving the shadows behind, ready to battle with the powerful Sahdow Bullet and Dark Call-GX attacks! 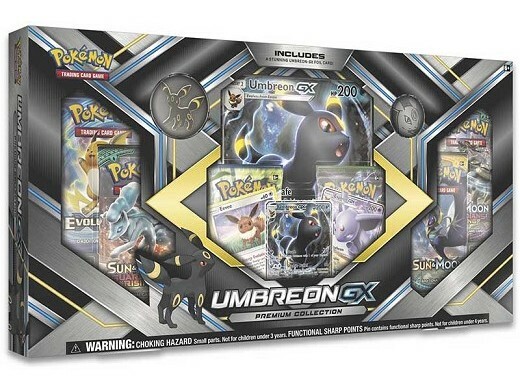 This collection brings you Umbreon-GX as a foil promo and oversize card, pin, and coind, along with foil cards featuring Eevee and Espeon-GX. Leap from the darkness with Umbreon-GX! 3 foil promo cards featuring Umbreon-GX, Espeon-GX, and Eevee!